Thanks to a craptastically-configured auction, a member of the ChallengerTalk forums snagged a steal-of-a-deal on a usually-goes-for-$45K Dodge Challenger SRT8 for just $29,100. Now the Signal Hill, CA car dealer's trying to back out of the deal. It feels to us like car dealers just don't get the internet in general and the rules of eBay in specific. First it was that BMW dealer that tried to back out of a deal, then it was the Hyundai dealer who didn't set a reserve price on a track pack-equipped Hyundai Genesis Coupe. Now another car dealer's trying to back out of a poorly-managed eBay auction which didn't go their way. 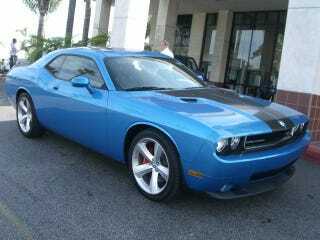 This time it's Glenn E Thomas Dodge Chrysler Jeep in Signal Hill, CA who placed a listing for a 2009 Dodge Challenger SRT-8 decked out in a handsome shade of blue, it even has a manual transmission.